The most well-known DUI field sobriety test administered by law enforcement is the walk-and-turn test. In this test, suspects must walk in a straight line, heel to toe, for nine steps. The police officer will then ask the person to turn and walk back in the same manner. The line may be “imaginary,” or the officer may ask the suspect to use the white line on the side of the highway. How do I know if the test was administered properly? First, the police officer must give clear and accurate instructions and may also demonstrate the act. The officer must also ask if the suspect understood the instructions before proceeding. Many times, language barriers are a cause for mistakes. What Conditions Cause Test Failure? Remember that field sobriety tests, such as the walk and turn, are not generally accepted by the scientific community as an accurate method to measure the quantity of alcohol in one’s blood or to prove the alleged state of intoxication. 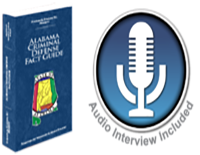 The bottom line is that—if you are charged with DUI in Alabama—there is no reason to give up hope! It’s your attorney’s job to help you explore avenues you never knew about, so you should hire an attorney who understands Alabama’s DUI laws inside and out. For more information on fighting your pending DUI after failing the walk-and-turn test, please contact our firm today!